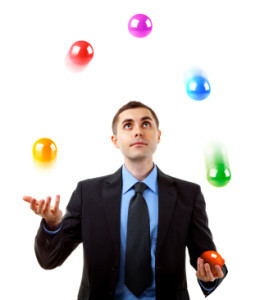 Competing priorities and demands for your time can leave you feeling like a juggler in the circus trying to keep all the balls in the air. Just when you think you have it under control someone approaches you with another ball to throw into the mix. When our days get out of control is often because we end up reacting to other people’s requests and losing sight of our own priorities. For a variety of reasons, some people have a harder time saying no than others. They may feel like they’re being rude if they say no or they may feel like it is their duty to be available 24/7. Whatever the reason, you must learn to say no if you want to maintain any sort of control over your time. While the word no is actually a complete sentence most people are not comfortable with such a direct approach and want to offer something more. There is good news. You can learn how to say no with diplomacy and tact. In the book Power Phrases!, Meryl Runion outlines a process for saying no firmly without being harsh. The process requires acknowledging the other person’s request, clarifying your current circumstances, and transforming your no into something positive. This approach helps you remain confident and strong without constantly caving into other people’s requests. For instance, if a co-worker approaches you to discuss the latest water cooler talk during your focused time you can politely say ‘I can’t talk now, I’m in the middle of something, how about catching up over a cup of coffee later?’ With this approach you maintain control of your time without feeling like you’ve brushed off the other person. Another common example is a manager who feels like they need to be completely available at all times to their staff. That just isn’t realistic and dramatically impedes your ability to be productive and efficient. Plus, it makes your staff dependent which limits their potential. Instead of stopping what you’re doing every time a team member wants your attention simply say, ‘Give me five minutes (or however much time you need) to finish up and I’ll be right with you. See what you can find out in the meantime’. This approach does two things, 1) it keeps you on track and 2) it gives the team member the opportunity to figure it out on their own. Don’t deny your team the opportunity to develop their potential by always giving them the answers. If your usual modus operandi has been to say yes to everything and allow interruptions don’t be surprised if you get a little pushback from people when start saying no. Don’t let that deter you. Keep on standing firm and people will eventually get used to it and they will respect you more. It may feel awkward at first because it is new for you but like any new practice, the more you do it the better you’ll get.